Journeys expansions. This series of 12-card expansions will bring players new champions, new actions, and two brand new types of cards: Quests and Relics. Fans can back the project for just $20 to get all four packs. The Ancestry Pack lets fans play as a Dwarf, Elf, Ogre, Orc, smallfolk, or – as a Kickstarter-exclusive – a half-demon. Each race has a health modification, special rules, a racial skill or ability card, and two cards that modify the starting deck. Ancestry packs will work with generic starting decks, or combine with character packs. Fans who get this expansion could play as an Orc Wizard, an Elf Thief, or a Half-Demon Cleric (hey – why not?). For $30, backers can get the Ancestry Pack, Journeys, and all unlocked stretch goals. 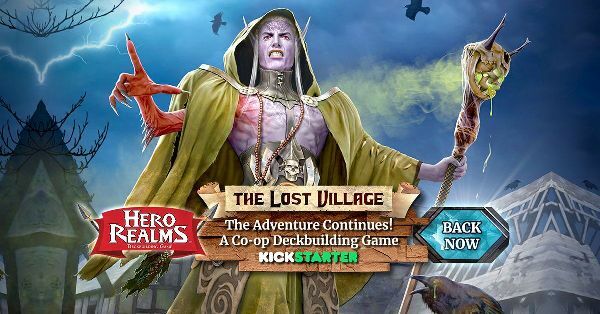 The Lost Village transforms the Hero Realms base game into a coop adventure: Investigating the disappearance of the population of an entire village. The Lost Village follows Hero Realms: The Ruin of Thandar, and allows players to keep upgrading their characters between fights. For $45, backers can get The Lost Village, the Ancestry Pack, and Journeys. The Everything Tier gets backers everything from both this Kickstarter and the first Hero Realms Kickstarter. It’s perfect for new players, because it catches up a collection in one click. It includes Hero Realms, the Character Packs, The Ruin of Thandar, and all six new expansions.